RALEIGH — Senators in North Carolina were met with angry shouts from hundreds of abortion activists on Wednesday after they passed several pro-life amendments late Tuesday night. 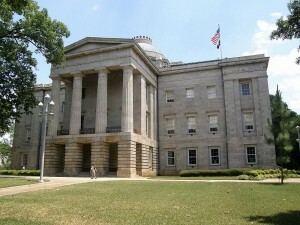 According to reports, a large crowd of abortion supporters began chanting “shame, shame, shame” outside of the legislative building in Raleigh after learning of the outcome of the vote. One woman was arrested during the protest, and the state lieutenant governor ordered crowds to be removed from the gallery area. The legislation at issue pertained to a number of amendments that were attached last-minute to a bill that barred state entities from utilizing Islamic Sharia law to formulate legal decisions. It was ultimately entitled the Family, Faith and Freedom Protection Act. One of the amendments prohibits insurance companies in the state from offering policies that cover abortion — an effort to counteract the requirements of Obamacare. A second amendment bans gender-based abortions, and a third measure protects health care workers of faith from having to participate in abortion procedures against their conscience. A fourth amendment requires that abortion facilities meet the same standards as ambulatory surgical centers — a law that has been passed in several other states across the nation, including in Pennsylvania and Virginia. Following a few hours of what the News & Observer characterized as “fiery debate,” Senators agreed to waive the rules and bring the matter up for a vote. “We can’t allow an assembly-line procedure that lets doctors run down the hall as they administer death,” declared Senator Ralph Hise during deliberations on the amendments. However, abortion advocates sharply opposed the measures, as well as Senate Democrats. According to the Huffington Post, Suzanne Buckley of NARAL Pro-Choice North Carolina accused the Senate of trying to “pull a Texas” for voting on the bill late at night without prior notice. As legislation passed easily in the Senate with a vote of 29 to 12, hundreds gathered the following day to protest the move. Police were present to control the crowd. Reports state that Governor Pat McCrory is yet undecided about whether or not he will sign the Act into law. He told reporters on Independence Day that he had not yet read the entirety of the bill. The Senate must now confer with the House to decide if they agree on the legislation as the amendments were not a part of the House version. Therefore, Christian groups are asking that pro-life supporters in the state make their voice heard just as loud as, if not louder than, the abortion activists. A hearing is set for Tuesday at 10:00 a.m. at the legislative office building in the capital.